with people from every state in the U.S. by the end of 2017. "I've spent significant time in many states already, so I'll need to travel to about 30 states this year to complete this challenge," Zuckerberg wrote in a Facebook post. 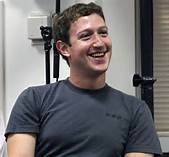 Zuckerberg is famous for his ambitious some might say eccentric New Year's challenges, including learning Mandarin, meeting a new person every day and only eating meat that he kills himself. In 2016, he tackled two challenges: running 365 miles in a year and designing a personal AI assistant to help automate tasks in his home. This year's challenge was informed by what Zuckerberg describes as a "turning point in history" caused by the combination of "technology and globalization." While Zuckerberg does not refer to the 2016 election explicitly, he alludes to a "greater sense of division" in the country and a need to make sure "the game... works for everyone." "After a tumultuous last year, my hope for this challenge is to get out and talk to more people about how they're living, working and thinking about the future," Zuckerberg says. Now he is following suit -- while keeping his day job, of course. "Recently, I've traveled around the world and visited many cities," Zuckerberg wrote in his post. "Now I'm excited to explore more of our country and meet more people here."